The 2nd Bromsgrove have just completed 3 months of the easiest fundraising ever. Their local Asda store participates in ‘Your Community Counts’ (the Green Token Scheme) and the Company was selected to be one of three community groups within Bromsgrove to be in the quarterly fundraiser. After applying to the store (a simple application form available from within the store) to be considered, they received confirmation shortly after that they had been chosen. Following this they did some promotion on social media and within the Company and Church through newsletters etc to encourage people to pop their tokens in their slot. The campaign with the most tokens was to receive up to £500 and the runners up each receive £200. As a runner up, the Company received £200, which they are putting towards resources and activities for our members this year. Besides the fundraising and publicity, the store’s Community Engagement team have offered to do some activities with the young people on healthy eating and cooking, free of charge, at church or in store. 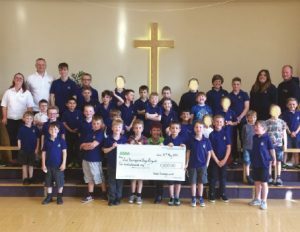 The money raised helped pay for a Juniors weekend away as part of the Juniors 100 celebrations. The weekend involved team games, swimming and night time hill walks all with the emphasis set on fun.